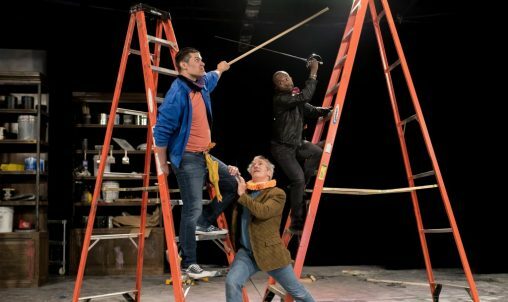 The Human Race Theatre’s production of “The Complete Works of Shakespeare (Abridged) [Revised]” featured Wright State talent behind the scenes and on the stage, including professor Bruce Cromer, center, and alumnus Shaun Tubbs, right. All it takes to see every Shakespeare play ever written is 97 minutes, a healthy dash of comedy and some Wright State talent. That’s what audiences experienced during the Human Race Theatre’s production of “The Complete Works of Shakespeare (Abridged) [Revised]” earlier this summer. On the stage, the production featured Bruce Cromer, professor of theatre arts at Wright State, and Shaun Tubbs, who received his bachelor’s degree in acting from Wright State. Director Aaron Vega also graduated from Wright State with an acting degree. Wright State talent was also involved behind the scenes. The production stage manager, Jacquelyn Duncan, received a bachelor’s degree in theatre design/technology with an emphasis in stage management from Wright State. “The Complete Works of Shakespeare Abridged” compiles all 37 of Shakespeare’s plays into one. The comedy involves three actors who attempt to act out the stories in their own way. The show ran from May 31 to June 17 at the Loft Theatre in Dayton. “The original trio of writers of the ‘Complete Works’ encourage performers and directors to bring new pop-culture references to the original script, to keep it current and specific to the intended regional audience,” Cromer said. Cromer said he thoroughly enjoyed performing in the play.